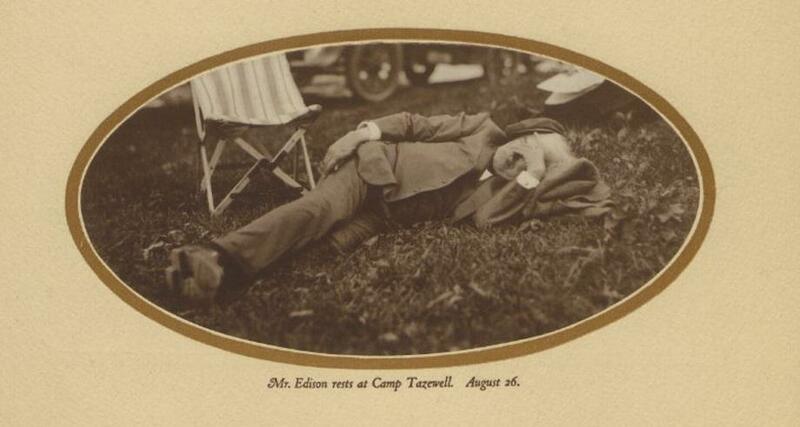 Thomas Edison and Henry Ford: Photo album from their 1918 car-camping trip. These photographs are part of an album compiled by the nature writer John Burroughs and published after his death in 1921. 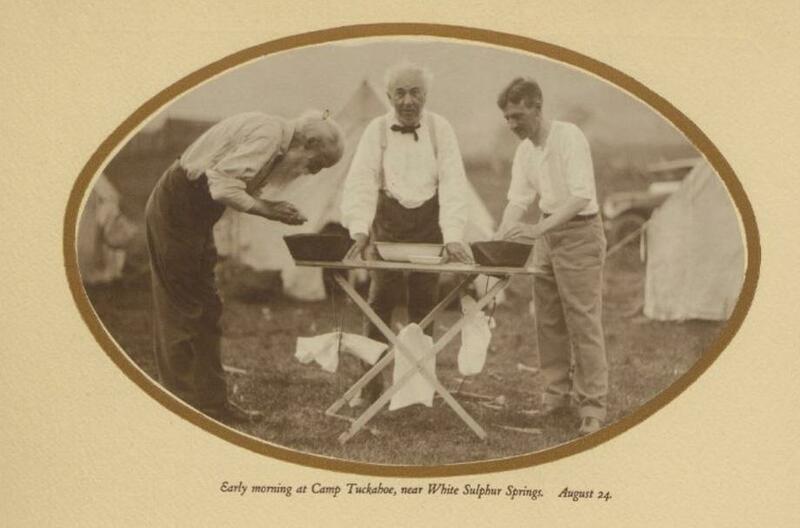 In it, Burroughs documents a 12-day car-camping trip he took in 1918 at the age of 81, along with 71-year-old Thomas Edison and their younger friends, Henry Ford and Harvey Firestone. This trip was one of a series. The foursome, adding or subtracting influential associates, made excursions of this kind from 1915 through 1924. The whole album commemorating the 1918 trip is available online, through the Harvard University Libraries. In August 1918, the four “vagabonds,” as they called themselves, headed a convoy of eight vehicles traveling a meandering route through Pennsylvania, West Virginia, Tennessee, and Virginia. 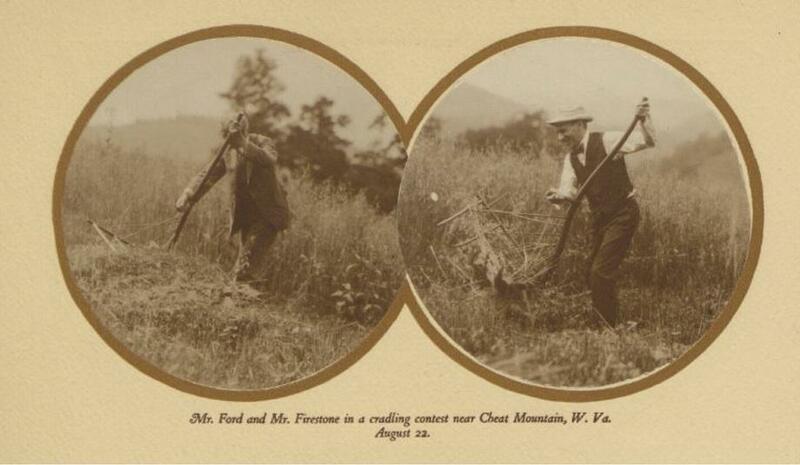 The group stopped to camp on farms, examine old industrial sites, take hikes along rivers, and (as one series of photographs documents) partake in playful contests measuring skill with farming implements. The group represented a potent concentration of early 20th-century celebrity and wealth. 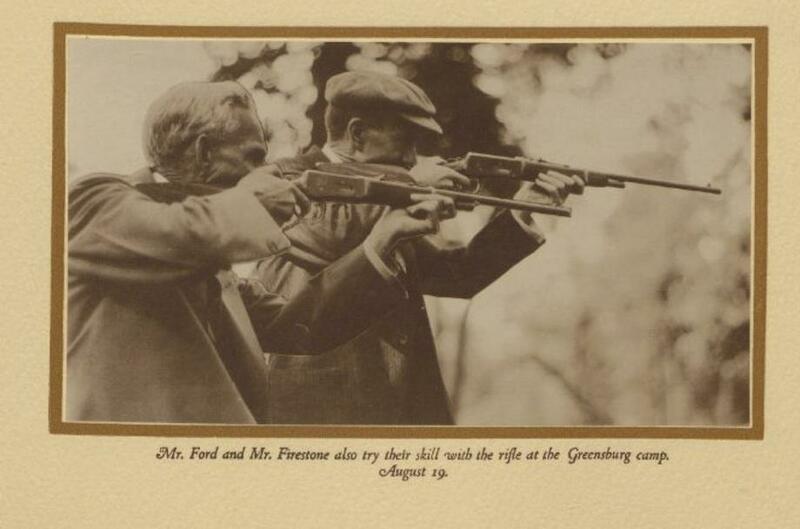 Edison and Ford are the best-remembered of the “vagabonds” today, but Firestone, whose tire company’s fortunes rose along with Ford’s, was also a prominent industrialist in his time. And Burroughs was a much-beloved writer on the tail end of a successful career. Burroughs’ story of the trip contains many observations about his famous friends. 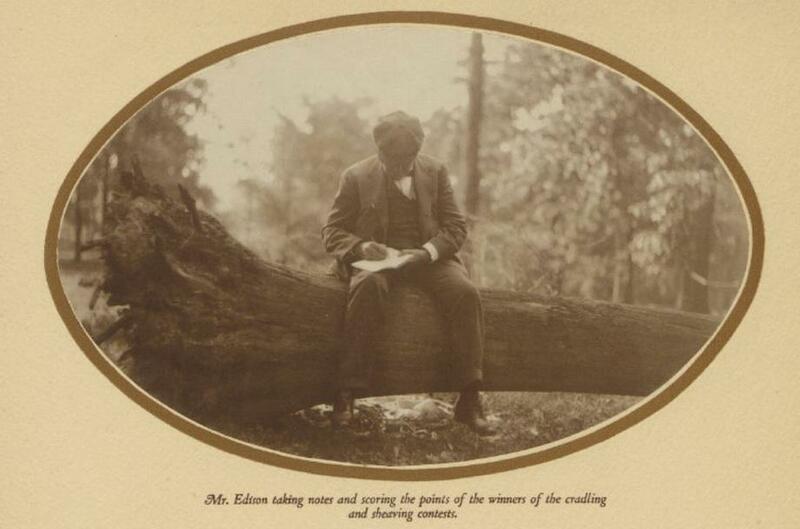 Edison needed the trip, Burroughs wrote, because it was “a shaking up … an antidote to his concentrated life.” The inventor sprawled on the ground at rest stops and meditated or read alone in one of the cars when the group had downtime. 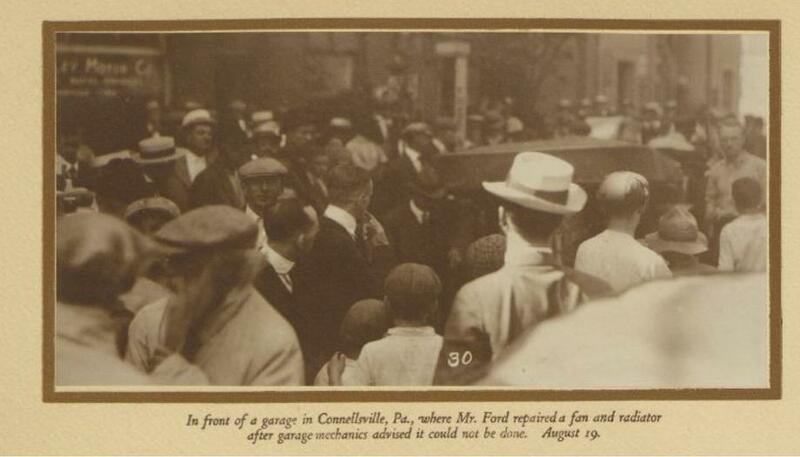 Ford was stubborn, an engineer at heart, and mechanically inclined; he tinkered with their cars throughout the trip, even managing to fix one that mechanics had declared a goner. At night, the group discoursed on Shakespeare, Thoreau, chemistry, and physics around the campfire. Besides being full of such anecdotes, the book also serves as a great document of the practice of automobile travel in its earliest days. The group asked leave to pitch their tents on farms along the way and visited with the locals. Frequent stops were necessary, as the roads were rough. Harvard University - Widener Library / Burroughs, John. 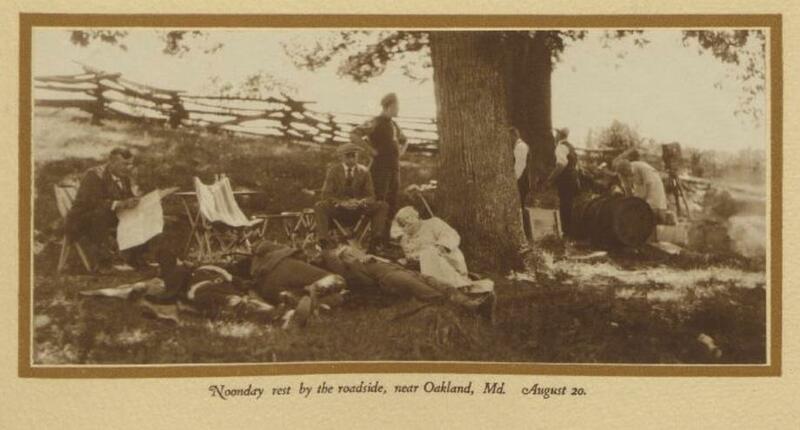 Our vacation days of 1918. [S.l. : s.n., 1921?]. L to R: Burroughs (in the beard); Edison; Ford (?). Harvard University - Widener Library / Burroughs, John. Our vacation days of 1918. [S.l. : s.n., 1921? ].